« Best time to visit Mauritius? On the other hand, some visitors do the exact opposite, and try to match their dates with a big festival or other event, to get a flavour of the real Mauritius. Whichever type you are, it’s good to know where to start! Below are the dates for the Public Holidays in Mauritius 2011. Worth noting is that many Hindu and Muslim festivals and events are based on sightings of the moon and thus dates are always subject to change. The below dates were correct at the time of writing. Worth noting is also that these are public holidays, and that many other festivals exist. 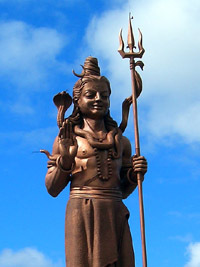 The picture above is that of the 33 metre high Lord Shiva statue near Grand Bassin, where the Maha Shivaratri is celebrated each year. Source: Government of Mauritius. Last updated: 14-FEB-2011.